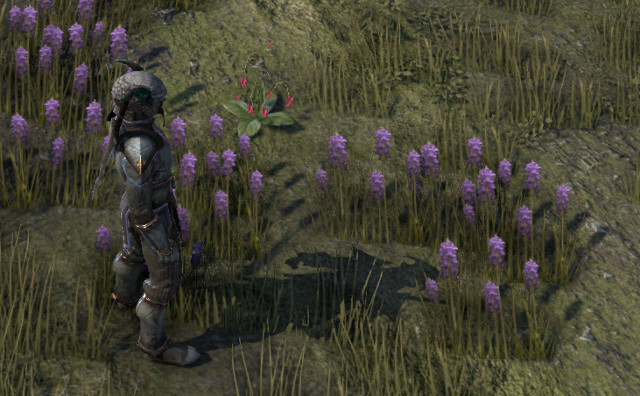 Crafting in The Elder Scrolls Online is deceptively simple. There are a lot of parts to it, but none of those parts is terribly complex. 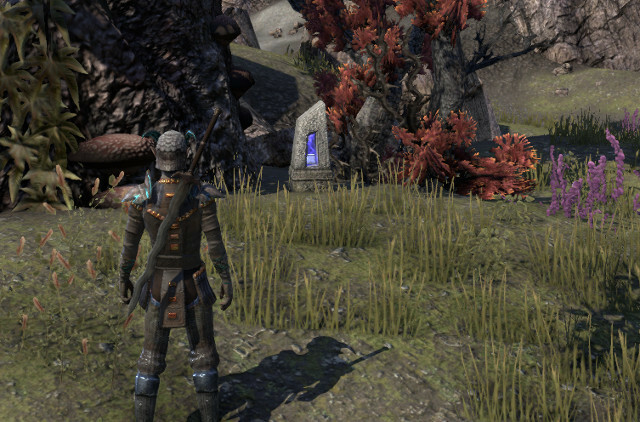 We walk you through the basics in this guide, and will have you up to speed and crafting in TESO in no time flat. This guide works for both PC and console, the UI differences are minimal. These are the skills used to make your basic gear. Blacksmithing makes Heavy armor and melee weapons, Clothing makes Light and Medium armor, and Woodworker makes bows, staves and shields. Though the items are different, the processes for all of these crafts are essentially identical. Most of these materials are fairly common. Be warned, though, that there is usually fairly stiff competition for these resources, and some players will have no compunction against "stealing" your node (e.g. ducking in and harvesting while you are fighting a nearby mob that prevented you from gathering it, or sprinting towards a node you are also running towards to get there first, etc.). That kind of behavior, while boorish and low, will occur fairly often, especially in the high-population low-level areas. Don't get mad about it - the other guy won't feel sorry when you chew him out - but do us all a giant favor and don't perpetuate it, either. Just move on and find another node. There are loads of them. Iron is usually found near large rock formations - for example, when I'm going out on an iron run, I hunt near the bases of cliffs. Look for the reddish blob, you can usually see it from a good distance away when you're looking for it. Because it's used for weapons and heavy armor, there is usually more competition for iron than for the other resources, and it might be difficult to find. Jute is found pretty much everywhere. Look for the distinctive orange flowers on the tall-ish plant. Occasionally, you will find insects hovering near it, and you will often find crawlers or worms when you harvest it. You can discard these extras if you need the pack space. Fishing bait is 0-value and super-easy to replace. Maple logs are most often found at the base of trees. It doesn't matter what kind of tree - palm trees are just as likely to shelter a maple log as any other type of tree. Maple logs are a little harder to see than the other resources because they are camouflaged and are often masked by tall grass. Also try checking along beaches for driftwood. Scraps of rawhide are needed for leatherworking, and can be harvested off of animals, typically of medium size or greater. The drop rate isn't terribly high, so if you want to make a lot of Medium armor, be prepared to do an awful lot of beast-hunting. It's much, much easier to level up Clothing using jute, and only use leather as needed. Processing raw materials is pretty easy. Find the appropriate crafting station, click on the very first icon in the crafting window, double-click to add your resource to the queue and hit R to process it. This process has a chance to yield some of the rare enchantment and improvement items, though the chance is small. Click the Deconstruct icon to recycle old, outdated gear, or trash gear from loot. You will get some processed resources from these items, and there is a higher chance to yield the rare improvement items (Honing Stone, Hemming, Pitch). You will also often obtain style stones from deconstructing trash gear. Some higher-quality items will have special enhancements that cannot be obtained by Enchantments. These items can be researched to unlock their mysteries, and that research will allow you to create similarly-empowered items later on. You can't make what you don't know, so make sure you research stuff as often as possible. Click the Research icon and scroll through the list to find items that can be researched. A researchable item will have a little number beside it in the scrolling list at the top, and the researchable quality will be noted in the list below. Double-click the item to be researched to add it to the queue, select the quality to be researched, and hit E to accept. 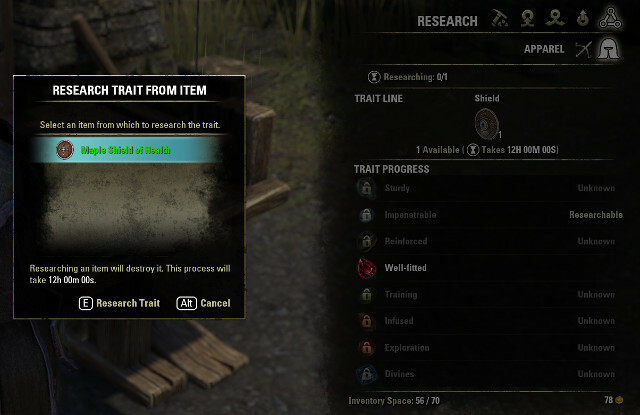 Research takes several hours (the low-level stuff requires 6 - 12 hours to complete), and you can only research one item per craft at a time, but you don't need to be near the workbench that whole time. Head off and do whatever, and you will be notified when your research is complete. Note that the research applies only to that item - for example, if you want to make a greatsword with a crit enchantment, you first have to find a greatsword with that same enchantment and research it. You won't be able to use the enchantment you researched from a 1-hander sword or a staff, even though the enchantment has the same name. Every race has their own unique crafting style, which relies on one particular mineral for the signature look. These styles are unlockable by finding blue-quality style manuals in loot drops (or you can buy or trade for them from other players). 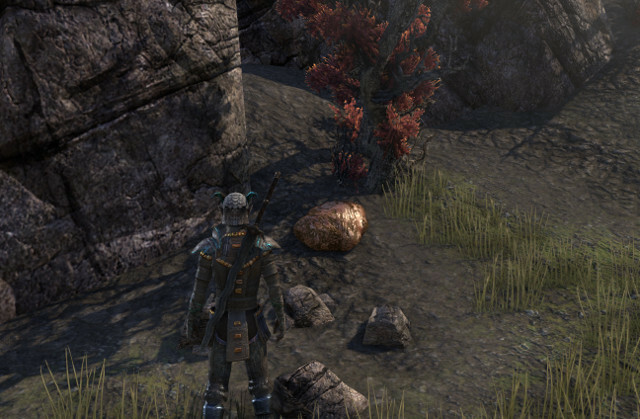 But even if you know a style, you still need the style stone, which is sold by crafting vendors. They are consumed at a rate of one style stone per item crafted, so if you are planning on a giant crafting binge, buy lots of them. You usually get style stones back when you deconstruct crafted items, so if you are trying to train up your crafting skill, recycling is fairly cost-efficient. Pick your item, pick your style, add enough materials to make it level-appropriate, add any enchantments you have studied and for which you have the appropriate gems, and hit E/R. Boom, you have your item. You can improve the quality of an item by applying quality-upgrade materials obtained through processing raw materials and deconstructing trash items. These upgrade items are fairly rare, so use them with caution. Each upgrade item adds a +20% chance to improve an items quality. If you try to improve your item using just one upgrade item, you will likely fail in the attempt and the item will be destroyed and the materials lost. Using 5 upgrade items gives a 100% chance of success, but, again, the upgrade materials are fairly rare. Upgrading is done in stages - from White to Green, then Green to Blue, and so on. Each stage has its own upgrade item of increasing rarity. The last step in the process is adding Enchantments to your item. This step is fairly easy - mouse over the item and hit R to open the Enchantment window. Click the Enchantment you wish to add and hit E. Done. Provisioning is the crafting of buffing food and beverages. 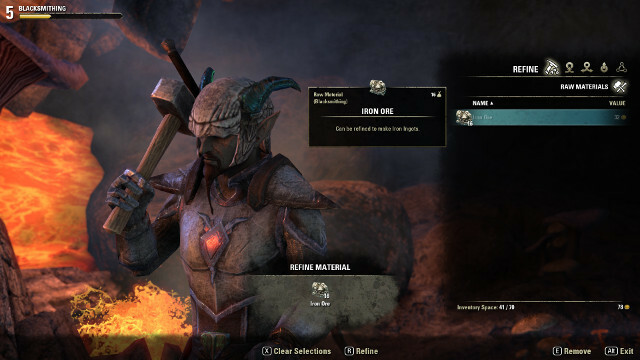 The crafting menu is a lot simpler than the gear-crafting menus - you make either food or beverage. You know all those barrels, crates, sacks, baskets and urns you see everywhere? That's mostly all Provisioning ingredients. You'll get tons if you loot everything you see. Unfortunately, this can also lead to extreme inventory bloat, and all of the Provisioning ingredients are 0-value items and you won't be able to use them all unless and until you find all the proper recipes. 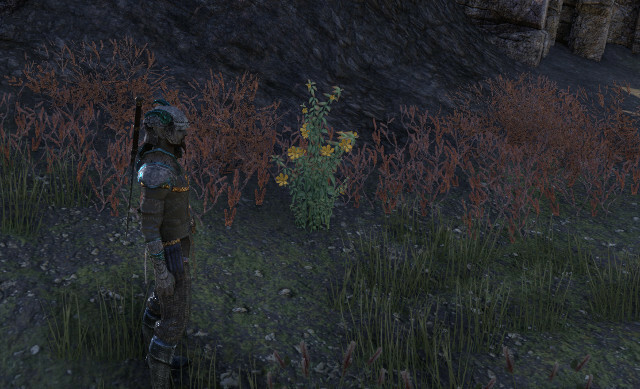 Back in beta, looting all the urns and chests and crates in Coldharbor yielded oodles of Provisioning recipes. 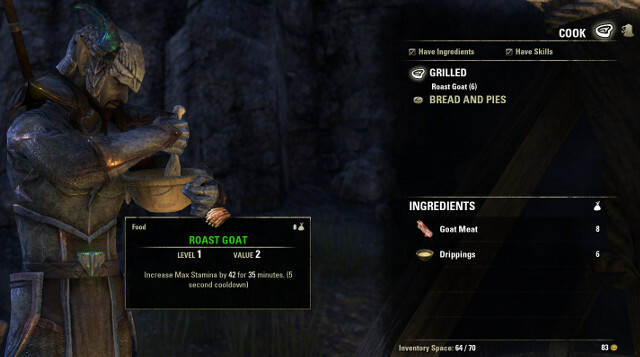 I usually came out with all of the beginner racial recipes - one of each food type for Health, Stamina and Magicka buffs. This is no longer the case, though - Provisioner recipes are green loot drops, and they rarely ever drop in Coldharbor anymore. You can only prepare foods for which you have the recipes, so if you want the full array of buffs, check the auction house for them, or watch general chat for players selling them. Straightforward - find a cooking fire, pick the recipe for which you have all the ingredients, cook it up. Potion brewing is a little more complex, because the ingredients are more rare and they have multiple effects. 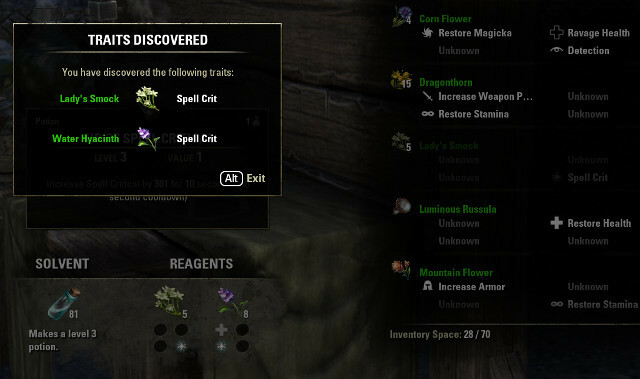 Each brewing reagent - flowers, mushrooms, roots, leaves and such - has 4 different properties, and must be combined with other reagents with the same properties in order to make a functional potion. If the selected reagents have two shared properties, the potion created with them will have two effects. 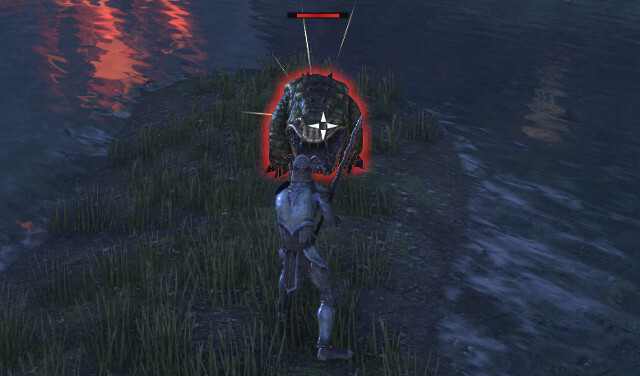 This can be awesome (for example, if a potion has both Restore Health and Restore Stamina effects) or it can be kind of useless (for example, Restore Stamina + Drain Magicka). Potions with negative effects are used as poisons, unless they are mixed with beneficial effects, in which case they are consumed as normal potions. Alchemy resources show up everywhere. If you see a brightly-colored plant that slightly stands out against its surroundings, chances are that it's an Alchemy reagent. Some plants are more difficult to spot than others - Luminous Roussala, for example, I only ever find by accident, but some are low-lying plants often obscured from sight by tall grass, or the colors don't stand out as strongly against the environment. I find that there's not nearly as much competition for these resources as there is for any other kind. It may be because the plants are occasionally difficult to spot and are easily passed-by, but I find them growing fairly frequently even in very heavy-traffic areas. Your mileage may vary. They're still fairly rare anyway because of the wide variety of plants - you might come up with a good armful of Alchemy reagents, but they're all different items. You'll also need to collect water for brewing. This can be found in wineskins or in little steamy, bubbly patches in rivers and other natural bodies of water. 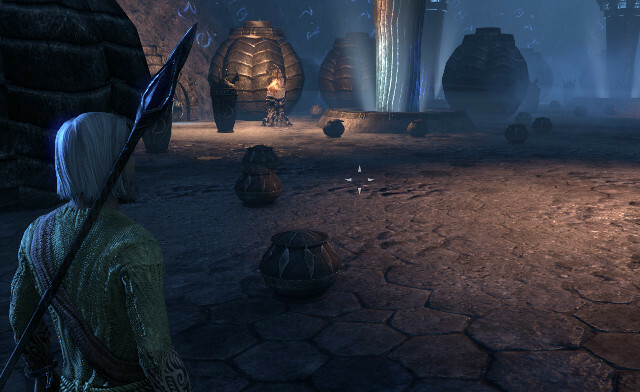 The type of harvest water determines the strength of the potion - for example, the "Natural Water" that you find in Coldharbor urns and such will make level 3 potions, but "Clear Water" found later in the game is used to make stronger, level 10 potions. All Alchemy ingredients have four properties for brewing, but when first discovered, none of these properties are known. You can do some experimental brewing to unlock these mystery properties, but there's always a chance you will combine two completely incompatible items and fail to unlock the properties of either. There's one guaranteed way to unlock the first property: eat the plant. Use it like a potion or food, and you will unlock the first, main property and receive that effect for a short time. This can be helpful if the plant has a Restore property, or not so great if it has a Ravage property. Obviously, this is an in-game-only thing - in the real world, this kind of testing is liable to get a person killed, so don't try this at home, kids! Add your water to the brewing stand and start mixing and matching your herbs. You will need to do a lot of experimenting to unlock all the hidden properties of the reagents, and you will probably end up wasting a lot of reagents doing this. If you want to avoid waste, just combine ingredients that have the same known properties, which you gleaned from eating them. But if you don't mind the cost of experimentation, go ahead and try out lots of weird combos. If you have lots of one kind of reagent, slot that one and try unlocking its properties by combining it with reagents you have only in ones or twos. As near as I can tell, this is the art of adding dragon shouts to your gear. You can add Enchantments to make your weapons do extra damage, or to your armor for Health and Stamina buffs, or a variety of other effects. 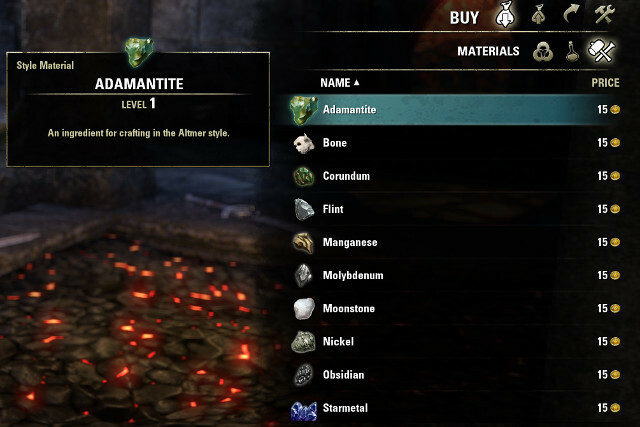 You can buy cheap ready-made Enchantments from the Enchantment vendor, or you can mix and match different runes to make your own. I often find them in kind of "clusters," located near another resource and tucked away among deco and rubble. They have different glowing cores - red, blue and green. 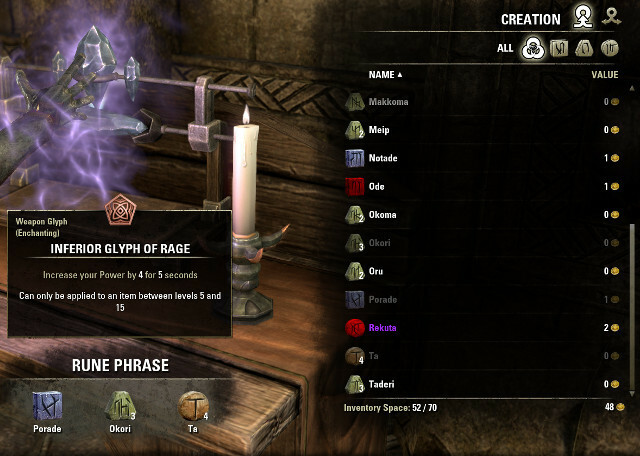 The glow color tells you what kind of rune the marker holds: red for Aspect runes (circular), blue for Potency runes (square) or green for Essence runes (hexagon). Interestingly, according to "Enchanting Made Easy" by Fishes-For-Runes (an in-game book you can find laying around at your local Enchanters), the devs have taken color-blindness into consideration: Aspect runes glow dimly, Potency runes have a medium glow and Essence runes glow brightest. You can also find runes in dungeon treasure, occasionally stored in sacks. There are tons of different runes kicking around, and you're probably going to need to buy inventory and bank upgrades if you want to get serious about Enchantment-crafting. Similar to Alchemy reagents, the various runes you find have unknown properties at first. It is only by combining them on the Enchantment bench that you find out what they do. You need to combine one Potency, one Essence and one Aspect rune to make an enchantment, and when you do so without first knowing what the runes actually do (which you sort of have to do for the first little while), the Enchantments you end up making will be a gamble. 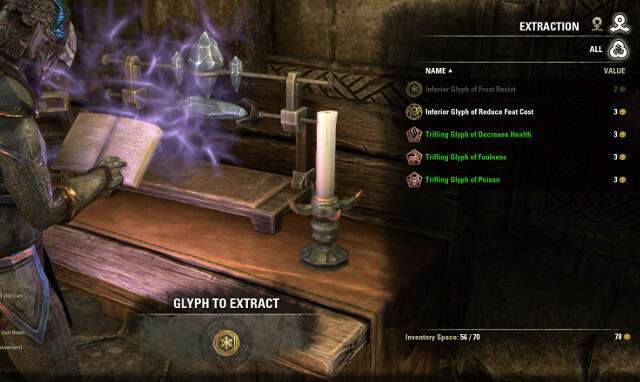 When I first start Enchanting, I try to cycle through as many unknown runes as possible to unlock their properties. I end up making a lot of junk Enchantments this way, but those can be deconstructed, and it unlocks the rune properties for later. Once you have the rune properties unlocked, you can set about making the kinds of Enchantments you want, cycling in different sets of runes to achieve the desired effect for the desired item type. For example, one set of runes might add a small Stamina bonus to a jewelery Enchantment, but swapping the Potency rune may change it to an armor Enchantment, and switching the Essence rune might change it to a Health bonus instead. At low levels, I find the circular jewelery Enchantments are essentially garbage. These items are level-range-restricted, and I'm not finding any enchantable jewelery under level 10. I have a few green and blue items from quest rewards, but these items have no Enchantment slots, so level-10-and-under jewelery Enchantments are a waste of resources. If you ended up making a bunch of crappy jewelery Enchantments during the experimental stage, don't worry - you can deconstruct useless Enchantments and recover some of the runes wasted in their creation. You get back one rune per deconstructed Enchantment, and, as far as I can determine, the type of rune you get back is arbitrary but consistent - i.e. breaking down one Enchantment will yield a square rune instead of a circular or trapezoid rune for no apparent reason, but it will return the square rune every time. Open your inventory, hover over the item you wish to Enchant, hit R. Select the Enchantment you wish to apply, hit E. Done. This will be enough to get you from level 1 to level 10, but there's more to it than just the basics. 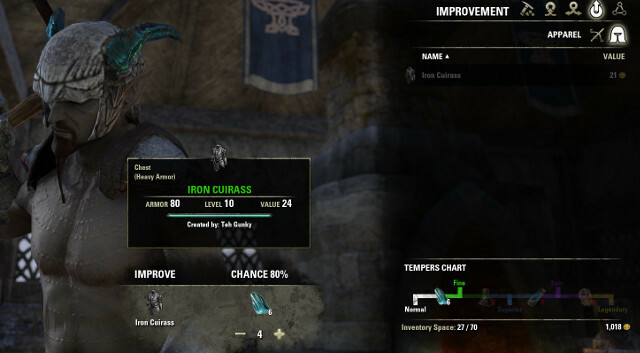 For example, if you really want to focus on crafting, there are a number of passive skill upgrades you can buy to make your character a more effective craftsman. Each craft has its own skill line, and if you want to get into the more advanced aspects of that craft - e.g. gaining the ability to create items above level 15 - you'll need to spend points and improve it. For example, if you want the ability to craft steel armor and weapons for level 16 - 26, you need to spend one point in Blacksmithing in the Metalworking passive ability. The Keen Eye ability, which makes ore deposits easier to spot when you are near them. This can be really helpful when out scouting for materials. The Miner Hireling ability, which is an "invisible NPC" who will mail you crafting stuff every day. The Metal Extraction ability, which increases the chance of finding Honing Stones and other improvement items during refining and deconstruction. The Metallurgy ability, which affects research time and allows for multiple simultaneous research projects. The Temper Expertise ability, which affects item improvement. The Clothing and Woodworking skill lines have essentially identical abilities. 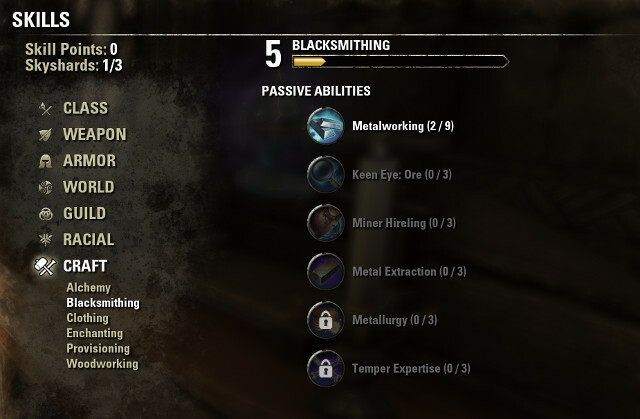 Some passive abilities are unlocked by gaining crafting levels - for example, one cannot learn the Metallurgy ability until reaching Rank 8 in Blacksmithing. Mastering your chosen craft requires as much dedication as mastering your weapon. Spend the points and the effort you put in will pay off over time.